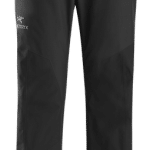 Soft, supple N40r GORE-TEX with PACLITE® Plus product technology is reinforced with N150p GORE-TEX with PACLITE® Plus product technology. Brushed polyester waistband; zippered fly closure and built-in adjustable webbing belt with metal buckle. No Slip Zip™ main opening with wind flap. Single chest pocket can also be used to stow jacket. Elasticized cuff at wrist and adjustable hem drawcord seals out cold. Zippered gusset accommodates various boot volumes.